Beginning with the 2011 field season, FPX Nickel carried out reconnaissance exploration programs on the Company’s other nickel-iron alloy properties in British Columbia, all of which cover sizeable ultramafic complexes with coincident airborne geophysical magnetic highs. The most advanced of these 100%-owned properties are the Orca, Wale and Klow properties. The Company incurred costs of approximately $2 million during its 2012 exploration program, which included approximately 4,300 metres of diamond drilling at the Wale and Klow properties. The Orca and Wale properties are located 35 to 45 kilometres east of Dease Lake (situated on BC Highway 37 between Stewart and Cassiar) and together cover an area of 157 square kilometres in the Stikine Ranges of northern B.C. These neighbouring properties encompass a 30-kilometre-long belt of ultramafic rocks of the Cache Creek Terrane. Access to the properties is by helicopter, directly from Dease Lake, and by a rough mining road and trails using all-wheel drive, heavy duty utility vehicles, which service the nearby jade and placer gold mining operations active in the area. A large northwest-southeast trending zone of awaruite mineralization was first discovered at Wale in 2011 during a regional exploration program, and mapped in greater detail early in the 2012 field season. 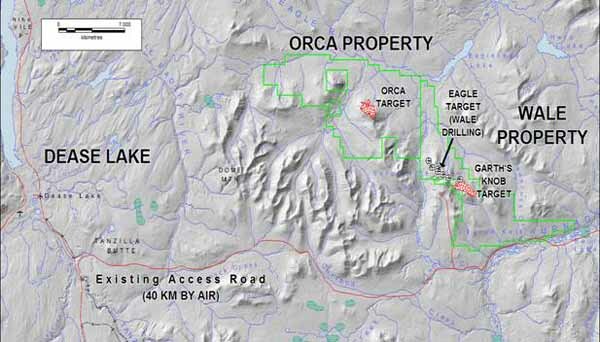 The adjoining Orca property was staked in November 2011 based on anomalous sample results generated from regional exploration work. Three main targets have since been identified — Orca, Eagle and Garth’s Knob, the latter two occurring on the Wale property. The target areas have been defined based on visual grain size estimations, partial extraction analysis for nickel-in-alloy and preliminary Davis Tube magnetic recovery analysis. The Orca-Eagle-Garth’s Knob mineralized trend measures a total of 14.5 kilometres in length. Investors are cautioned that the exploration targets at each of its British Columbia properties are early-stage exploration prospects, conceptual in nature. There has been insufficient exploration to define a mineral resource and it is uncertain if further exploration will result in the target being delineated as a mineral resource. The above technical information and all the other technical information on this website pertaining to geology and drill hole data was prepared under the supervision of FPX Nickel’s Chairman Dr. Peter Bradshaw, P. Eng., a Qualified Person as defined in National Instruments 43-101 – Standards of Disclosure for Mineral Projects.